We recently caught up with Dyrlaga to find out more about her inspiration and processes. “When I first started, apart from being drawn immediately to it from an aesthetic point of view, it was the practicality of it! I was a student at the time, without a permanent studio space. It wasn’t complicated, could be stored, kept, and acquired easily and didn’t require any specialized equipment. It cost much less than other mediums and it meant that I could be as prolific as possible and not have to worry about making expensive mistakes. It was quite freeing at a time when I was exploring the subject matter of the pieces I was starting to make,” Dyrlaga said. Why do you think you’re drawn to nature-inspired motifs? “I guess quite simply, I find it beautiful and it brings me a lot of joy! It is all around us and is something that everyone can relate to on some level. From a small child, I have always been drawn to nature,” she explained. “My work is usually quite vague when I start. I will have a detail or a general idea of what I want to create. I will draw a loose outline in pencil and then I will start adding detail as I cut. I often figure out the full composition as I am working on it, so it changes a lot before its finished, as I move things or add things into the image. I cut the detail in sections using a sharp knife. Everything is drawn in reverse, and then when I have finished cutting the image out, I flip it over and the “clean” side is the finished piece of artwork,” Dyrlaga added. 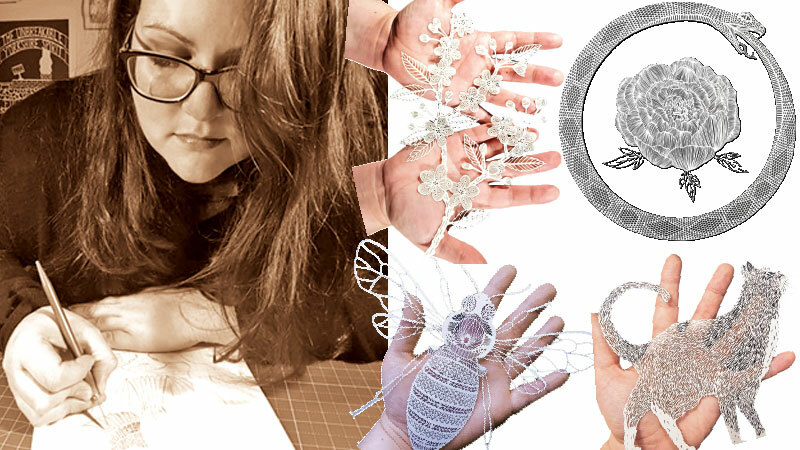 Her advice to those who want to take up paper-cutting art is that since the tools and materials are so accessible, experiment a bit to find the right ones for you. “Make sure you are working in a well-lit area with a good surface such as a cutting mat. Most of all, just enjoy it. It’s a very enjoyable pastime! If you aren’t ready to start designing your own pieces, there are lots of artists that offer ready-to-cut templates for you to get started,” she advised.